Every Wednesday, Chicago John writes and posts delicious family recipes, photographs ingredients and dishes that make your mouth water, and tends roses with movie star names. His creative talent, imagination and wit like no other blogger. Followers on my blogs follow his comments and write fan mail! Yesterday and today he has hit it out of the park. Welcome back. 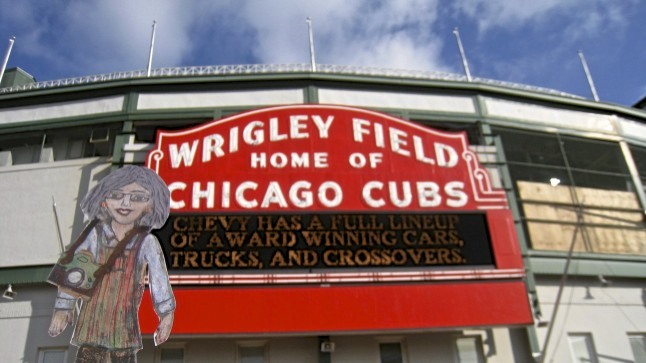 To recap Part 1, friends and I have, at this point, attended 3 Cubs games, with Flat Ruthie joining us for 2 of them. 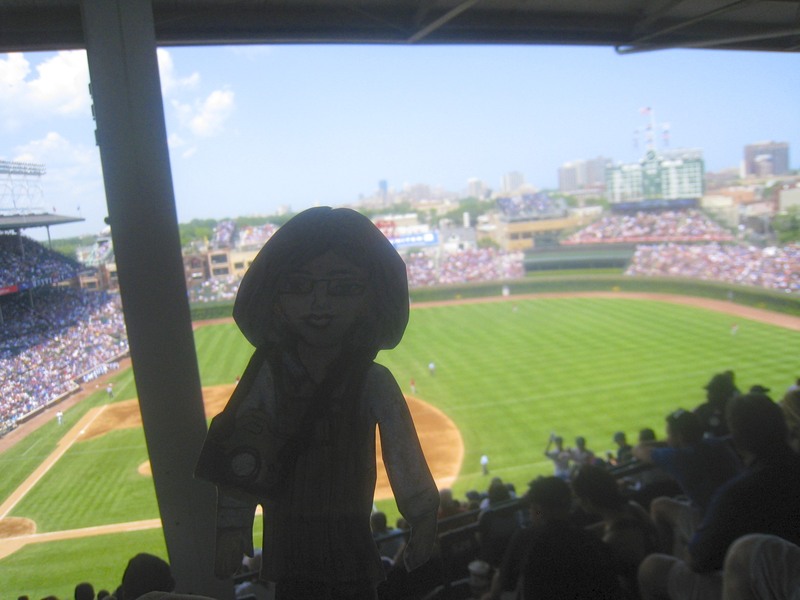 The Cubs won the games when Flat Ruthie was in attendance and lost the game she missed. The next game that we attended was against the New York Mets on June 26th. With temperatures soaring well into the 90′s at game time, surprisingly, we spoke little of the weather. Our focus was on Flat Ruthie. Would she bring another victory to this most beleaguered of all ball clubs? Well, the most amazing thing happened. Here’s Flat Ruthie posing for me. Please take note of the Man in the bottom left corner. 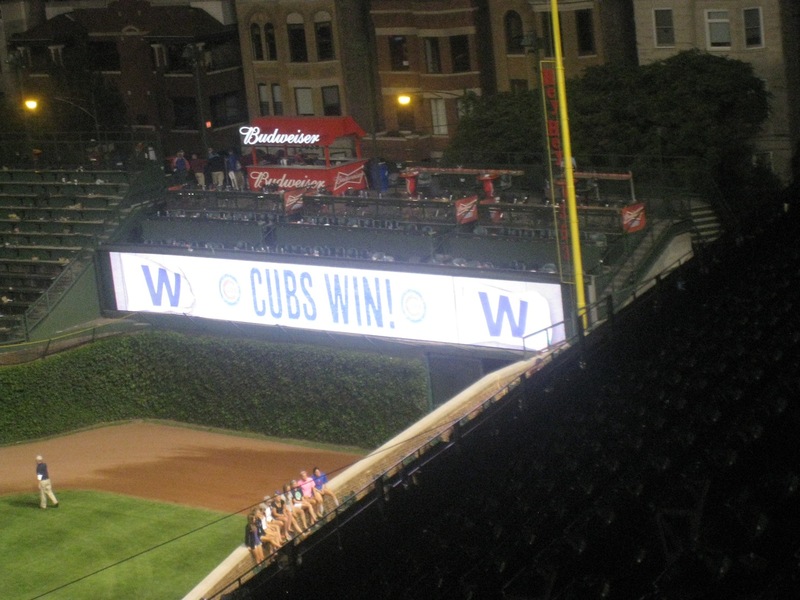 Yes, the Cubs won that game, 3 – 1, but for once that wasn’t the amazing thing. As I was attempting, unsuccessfully, to get a photo of both Flat Ruthie and the Cubs score board, the Man in the photo revealed himself. With devoted fans singing the last of “Go, Cubs, Go!”, this Man reached deep, deep into his pant pocket to retrieve his very large … Flat! You see, this Man seated before us was the Keeper of the New York Mets’ Gnome of Defeat – and that’s not even the miracle! Agog, I watched as he photographed The Gnome, trying to capture both Gnome and some significant sight within Wrigley Field. When he was finished, I asked if The Gnome wouldn’t mind posing with Flat Ruthie. Demonstrating that unique camaraderie that exists between all Flats, The Gnome graciously agreed. I took the picture, bid Gnome and Keeper farewell, and we headed for the exit. Flat Ruthie had just witnessed a 3rd victory. Someone pinch me. I must be dreaming! It wasn’t until later that night, after I uploaded the photos, that I first caught glimpse of it — or did I? There, in the photo with The Gnome of Defeat, Flat Ruthie was sporting a … a … well, look for yourself. Do you see it? Skeptic that I am, I thought this some sort of fluke. Perhaps I’d inadvertently captured a ring toss game in progress or some such thing. Needless to say, I put the photo aside, vowing never to mention its existence to anyone. Tell me you wouldn’t have done the same. It wasn’t long before we found ourselves once again passing through the turnstiles of Wrigley Field to witness a game against the Arizona Diamondbacks. On this day, July 15th, not only did Flat Ruthie join us but so did another Friend, one who would never be considered a fan of America’s Pastime. Although you cannot see it in the above picture, the Cubs jumped to an early lead and fought hard to maintain it. Sometime during the 6th inning, my-less-than-fanatical fan Friend left to stretch his legs. As he walked around the park, the rest of us wondered if Flat Ruthie was behind these Cubs victories. You see, we’ve been to plenty of games, mostly losses, and it would be absurd to think that skill or even blind luck was behind this recent string of wins. Something else was at work here. I said nothing of the photo. We were now into the top of 7th inning. Suddenly, the batter knocked a foul ball high into the Upper Deck on the other side of the stadium. I watched in amazement as it bounced directly in front of our Friend and landed right into the palm of his outstretched hand!!!! Unwilling to believe my own eyes, I turned to the others and asked if that was, indeed, our-less-than-fanatical fan Friend. Once Cynthia, who only moments before had fainted dead away, was revived, all agreed that it was, in fact, our Friend. Try to understand the enormity of this. The rest of us have been going to Wrigley for decades. We’ve sat in virtually every section of that ballpark, and that includes a few of the rooftops across Sheffield Ave. We’ve gotten sunburned, drenched, and, on one memorable Opening Day, snowed upon. We’ve attended many a season’s first game, as well as its last, and far too many games in-between to count. We’ve sat stunned as we watched opportunity slip away and partied with the throngs on Clark St when the Cubs clinched a Playoff berth. We’ve done all that, and more, but never has a ball come within 50 feet of any one of us. Never! So, my-less-than-fanatical fan Friend returned to us, souvenir ball in hand. Of course, Flat Ruthie insisted upon having her picture taken with them both. All the while, the rest of us groped for answers. How could this be? Are we on the verge of the Apocalypse? Do we walk into the Light or run from it? Was it too late to buy another round of beer? (One can question and still be thirsty.) Despite so many questions demanding answer, I shot my photograph. Seconds later, when I checked the photo, there it was for all to see. 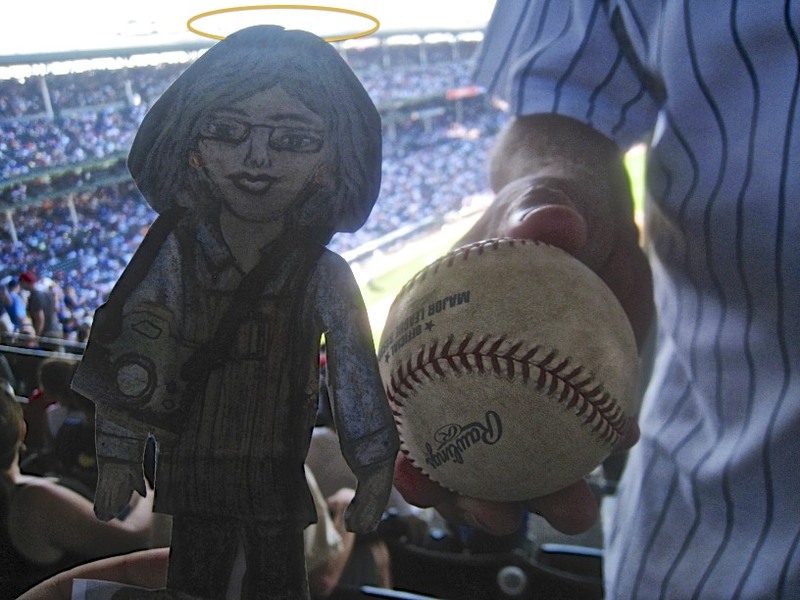 Flat Ruthie’s Halo had re-appeared — and this time for good. There was no ring toss game in the background. (No beer vendor either.) This was Flat Ruthie, Miracle Worker, pure and simple. She delivered unto my-less-than-fanatical fan Friend a foul ball, thus revealing her powers for all to see. I never should have doubted the first Halo sighting. Yes, the Cubs won that game but, given the circumstances, the win did seem a bit anti-climactic. 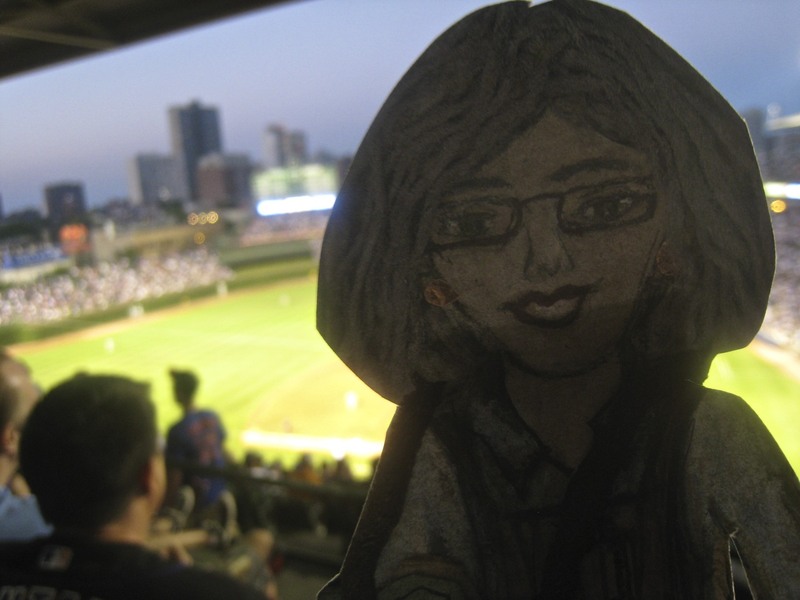 Still, a win is a win and, lest you’ve forgotten, the Cubs have won each game with Flat Ruthie in attendance. That’s 4 out of 4 victories thus far this season. Now that her true self has been revealed, will Flat Ruthie continue to help the Cubs or will she see fit to punish me for doubting her after the Mets game? There’s only 1 way to find out. We’ve tickets for more games this season. I will let you know. In the meantime, to learn more of Flat Ruthie, the indefatigable World Traveller, Bonne Vivante, and now Miracle Worker, please click HERE to go to her website. This entry was posted in Blogosphere Travel and tagged baseball, beer, Chicago cubs, Chicago IL, Chicago John, Flat Ruthie, Gnome of Defeat, Italian recipes, NY Mets, Rawlings, sports, summer, travel, vacation, Wrigley Field. Bookmark the permalink.